Over the past few years, there has been a growing realization that a significant chunk of the dollar-rupee trade may be leaving Indian shores for offshore markets, but the issue has not yet received the policy attention it deserves. Two recent high-profile events: the announcement of demonetisation on 8 November, and the election of Donald Trump on 9 November, can help us understand how important the offshore markets have become today. Our analysis of high frequency trade data during these two days suggests that price-discovery during certain times of the day is taking place offshore, with spot prices following the trends in the offshore markets. The growing role of a relatively unregulated offshore markets in determining the value of the rupee is a cause for worry, as it makes our currency markets more vulnerable to international shocks, and undermines the effectiveness of actions taken by the Reserve Bank of India (RBI) to tackle such shocks. The rise of multiple venues for trading dollar-rupee products has given global investors the ability to take a view on the rupee almost on a 24x7 basis. From 9:00am to 5:00pm IST, they can trade in the onshore market, which has a large bank-led over-the-counter (OTC) segment, and a smaller but growing exchange futures and options (F&Os) segment. Once India closes, they can trade in F&O on offshore exchanges such as DGCX, SGX, CME and ICE. Of these DGCX, the most liquid, trades from 8:30am to 1:00am IST. Or they can trade in the non-deliverable forward (NDF) market, a cash settled OTC market, which operates round the clock, shifting from Singapore to London to New York based on time-zone and trading interest. When demonetisation was announced, NSE was closed but DGCX and the NDF were trading. USD-INR prices on DGCX dropped by 50 paise from Rs67.2 (at 8:30pm) to Rs66.7 (at 1:00am), signalling a rupee appreciation. The global spot followed this trend. The NDF, on the other hand, took an opposing view from the start, signalling rupee depreciation. Between 8:30pm on 8 November and 6:00am on 9 November NDF prices increased by 70 paise to Rs67.2. Our analysis shows that once DGCX closed at 1:00am, the global spot started following the NDF market trend. High-frequency data also allows us to see the reaction of NDF market to the local and international news sequentially. 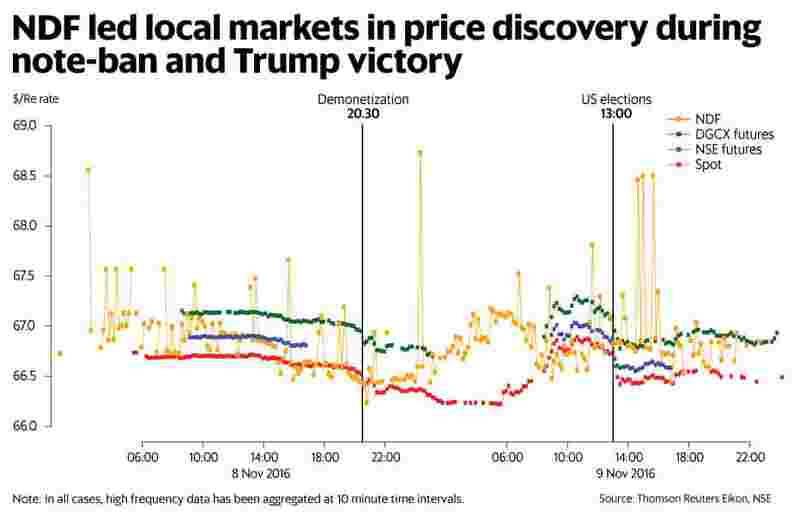 Demonetisation elicited a depreciation response, but by 6:00am on 9 November when Trump started leading, the response inverted to an appreciation. Between 6:00am and 9:00am, the time when NSE opens, NDF prices declined by 90 paise, from Rs67.2 to Rs66.3. On 9 November, both DGCX and NSE opened with a gap, but because the two events elicited opposing responses from the market, the net-gap down was small. Between 8:30pm on 8 November and 9:00am on 9 November, when the Indian market was closed, the NDF market saw aggregate dollar-rupee trades worth $4.5 billion. To put this in perspective, daily trading in dollar-rupee futures on NSE is around $2-3 bn and trading in the onshore OTC market is around $21 billion, of which $2-3 billion is in forwards and the remaining in swaps. What this suggests is that the demand and supply for dollar-rupee trading is far more than what the RBI is permitting onshore. The size and liquidity in the offshore market is, in effect, a proxy for the cost of capital controls that are imposed onshore. It represents trades and revenues that the onshore market has lost out on. At present, the onshore market is the natural venue for price discovery of the rupee. It is deliverable, liquid, has a wider participant pool, and is the first to consolidate local information. However, it is open only eight hours a day and is heavily regulated by the RBI. There are strict controls on participants, instruments and trades, and the RBI directly intervenes by itself trading in this market. In contrast, the offshore market trades round the clock and is largely unregulated, governed by ISDA master agreements and exchange platforms’ trading rules. Since RBI does not permit its regulated entities in the offshore market, offshore arms of foreign banks/investors, hedge funds and Indian firms with offshore presence trade here. As the chart below illustrates, the offshore market has been growing in size over the past few years, accounting for a third of the onshore volumes, and accounting for more than a quarter of total volumes. The growing role of the offshore market in shaping the direction and nature of the rupee-dollar trade makes the rupee more vulnerable to international shocks. It limits the effectiveness of RBI interventions in the forex market and poses a serious challenge for currency and monetary policy management. Trading in the offshore market affects prices in the onshore market, evident from the gap-down in both NSE and DGCX between 8 and 9 November. While the offshore and onshore markets tend to move in tandem in general, during episodes of rupee depreciation, downward pressures emanates from the offshore market and influence onshore prices, a 2013 RBI Working Paper, Rajan Goyal, Rajeev Jain and Soumasree Tewari showed. “Such asymmetric behaviour of spot/forward and NDF markets could be attributed to the fact that during period of rupee depreciation when markets are relatively more volatile, the Reserve Bank tries to contain volatility in foreign exchange market by undertaking certain measures", the trio wrote. “Such measures constrain ability of market players to undertake forward contracts in domestic forex market and might be leading domestic entities to take on such forward contracts in overseas markets thereby resulting in higher volume in NDF market. Thus, with increasing depth of NDF market, rupee is likely to become more prone to shocks emanating from overseas markets...," they added. Our analysis points to a larger concern: that price discovery of the dollar-rupee rate may be taking place offshore at certain times during the day (or night). These are not mere academic concerns. During the taper tantrum of 2013, a host of currency defence actions taken by the RBI could not stop the dollar-rupee exchange rates sliding from Rs62 to Rs70, as the economist Ajay Shah of the National Institute of Public Finance and Policy (NIPFP) had pointed out in a blog-post . During similar episodes in the future, RBIs ability to influence the currency market will be further weakened, given the growing offshore market size. The policy discourse on the offshore market needs to focus on the fundamental reason why it exists. We in India believe that with capital controls, residents have no choice but to comply with such controls. This is not true. If the offshore market is attractive enough, even resident entities will find ingenious ways to shift their currency trading offshore. So far the policy response to a growing offshore market has ranged from outright denial to grudging acceptance. No substantive reforms have been undertaken to make the onshore currency markets more competitive and attract the offshore volumes onshore. Unless an active and effective strategy to compete with the offshore market is put in place, there is a possibility that over time the onshore market may lose its dominant position in setting the price of the domestic currency.